The sound of music is filling the halls of Canutillo schools and taking students to higher notes on the national stage. May 28, the Canutillo Middle School Honor Band and the Jose Damian Elementary Chamber Choir each won the 1st Place Gold Award at the prestigious Worldstrides Heritage Music Festival in Anaheim, CA. The group of 45 CMS band members was also honored with the Spirit of Anaheim Award given to one group among elementary & secondary; band, choir, jazz bands, and orchestras whose conduct demonstrates professionalism, concert etiquette, best attire, and school pride. The elite Jose Damian Elementary Chamber Choir, directed by Rocio Rodriguez, wife of the CMS director, Christian Rodriguez, won the 1st Place Gold Award for the second time at the festival in Anaheim. In five seasons, the JDE Choir has won many awards and special recognitions such as being recognized by State Representative Joseph Moody in 2013. “Most of the JDE choir members move on to join choir or band in middle school, and pursue a career in music,” Rocio Rodriguez said. 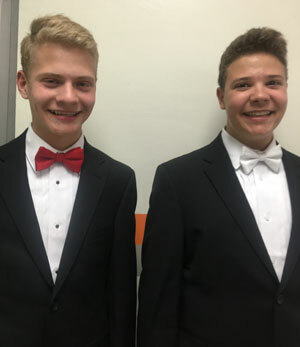 In fact, two former JDE Choir members, twin brothers Myles and Elliot Lavis from Alderete Middle School will sing at the 2016 Honors Performance Series at Carnegie Hall in New York City June 25. Myles will perform as Second Alto and Elliot will perform as a Second Tenor at the 125th anniversary season at Carnegie Hall with the Honors Junior Choir. The Lavis brothers auditioned this past fall for the Honors Performance Series at the recommendation Ms. Alejandra P. Martinez, their Alderete Middle School Choir Director. They both were accepted as finalists into this exclusive group of talented performers and will join other students from across North America and select international schools to study under the masters in New York City and perform in the celebrated venue, Carnegie Hall, which should prove to be an enriching, rewarding and memorable experience. Canutillo ISD Superintendent Dr. Pedro Galaviz emphasized the significance of fine arts education. If anyone would like to support the Lavis brothers’ efforts, get more information here.